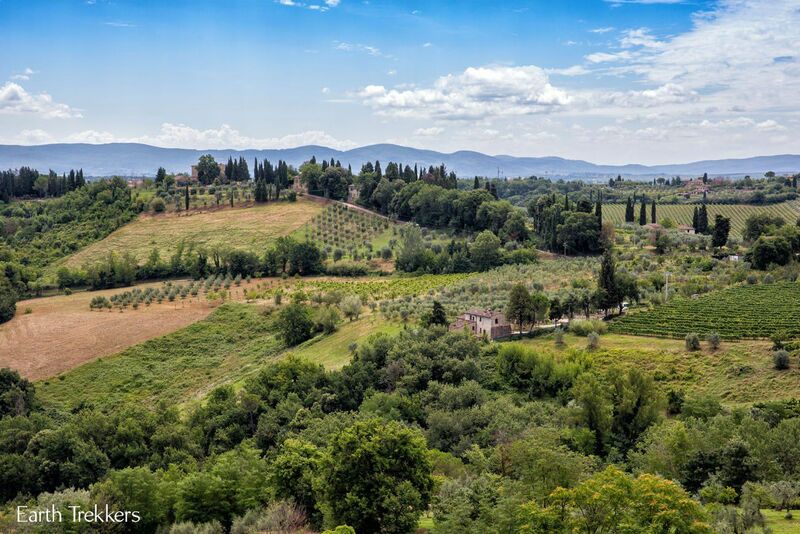 Tuscany, Italy is known for its wine and splendid scenery, and we loved the time we spent here. 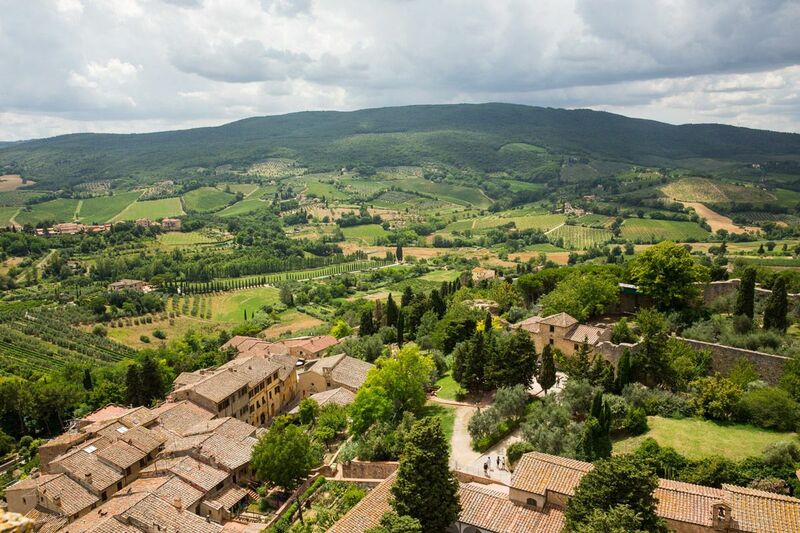 The hill towns of Tuscany are small, walled, medieval towns perched on hilltops overlooking the countryside. Their views are stunning, their streets are a joy to stroll through, and the wine tastings are phenomenal. 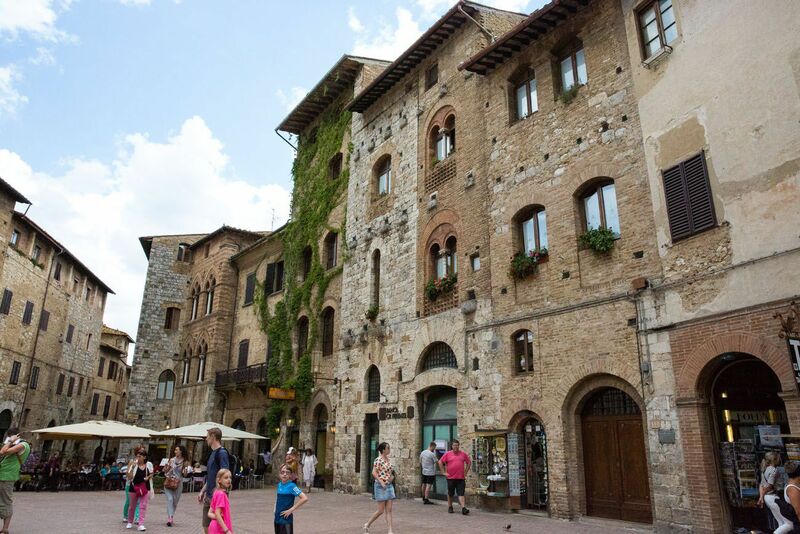 We visited several hill towns, and the very popular San Gimignano was one of our favorites. 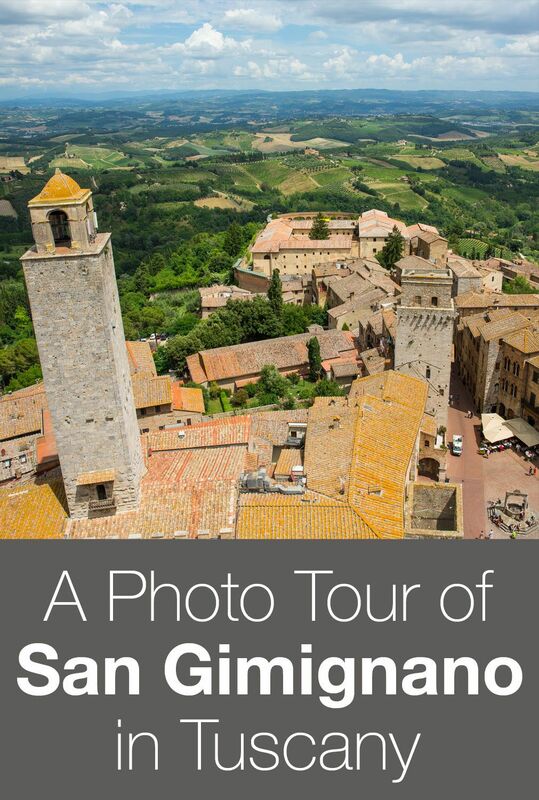 If you are touring Tuscany and are trying to decide which hill towns to visit, consider San Gimignano! This town is very popular for good reason. 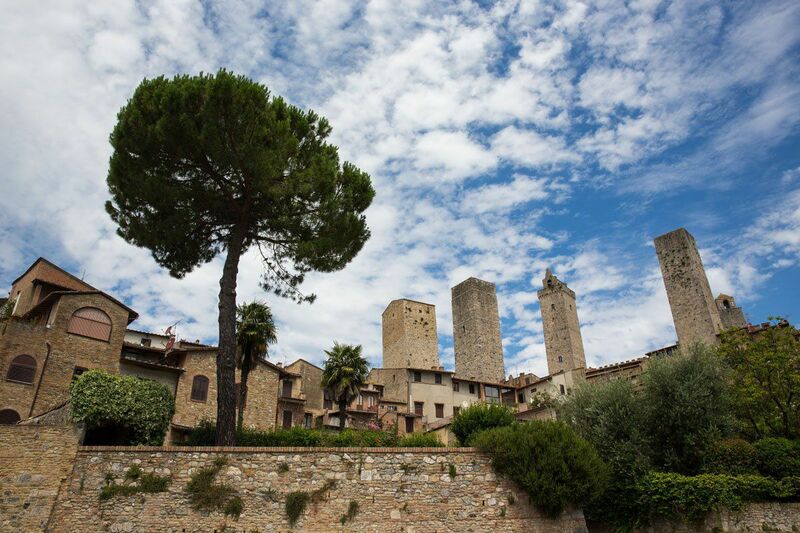 San Gimignano is famous for its medieval towers. 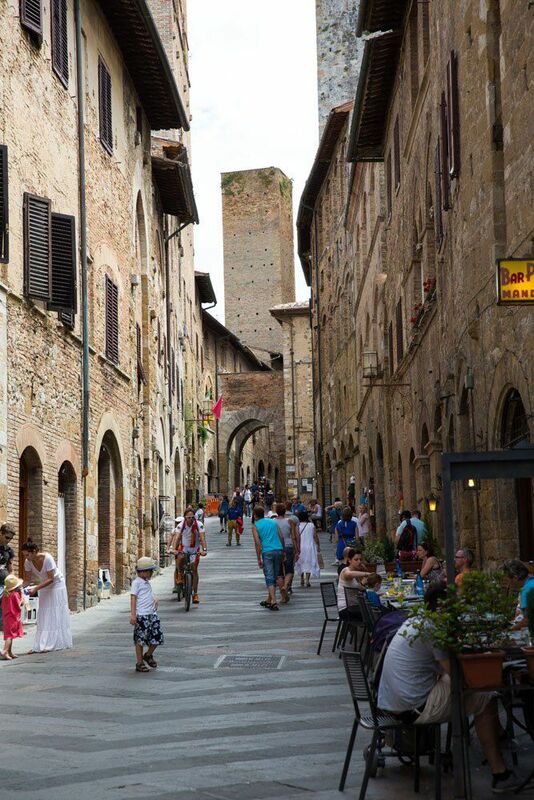 In fact, San Gimignano has more medieval towers than any other hill town in Tuscany. Fourteen of these towers are still standing. 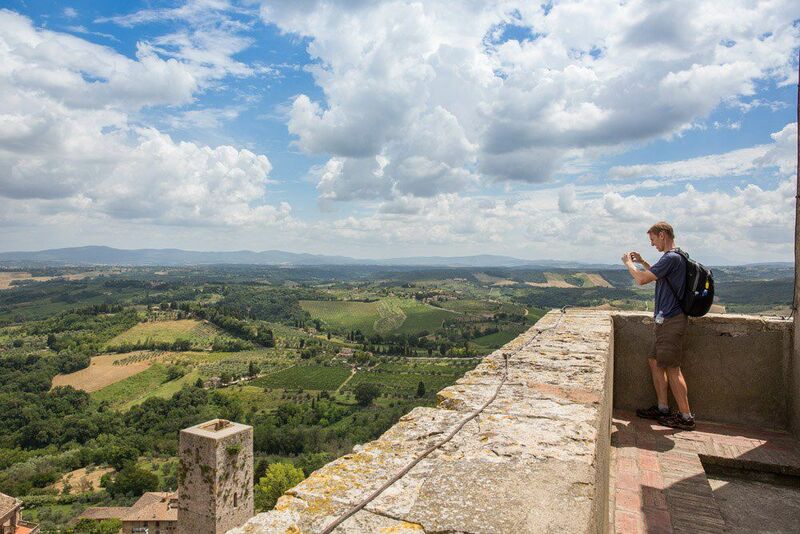 We were able to climb the Torre Grossa, also known as the Bell Tower, and the views were some of the best of Italy so far. The views from the tower are awesome but we also really enjoyed walking through the streets. It is mostly a pedestrian only town, with the occasional small car navigating through the narrow streets. 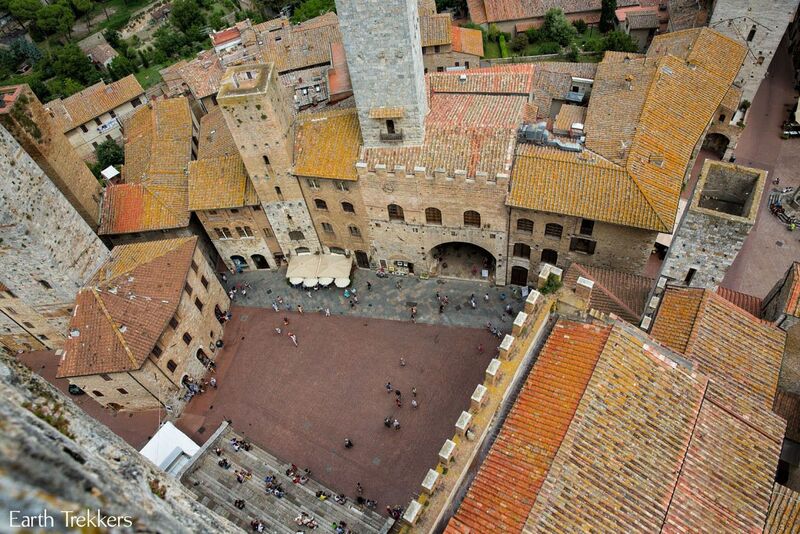 The Historic Centre of San Gimignano is a UNESCO World Heritage Site. 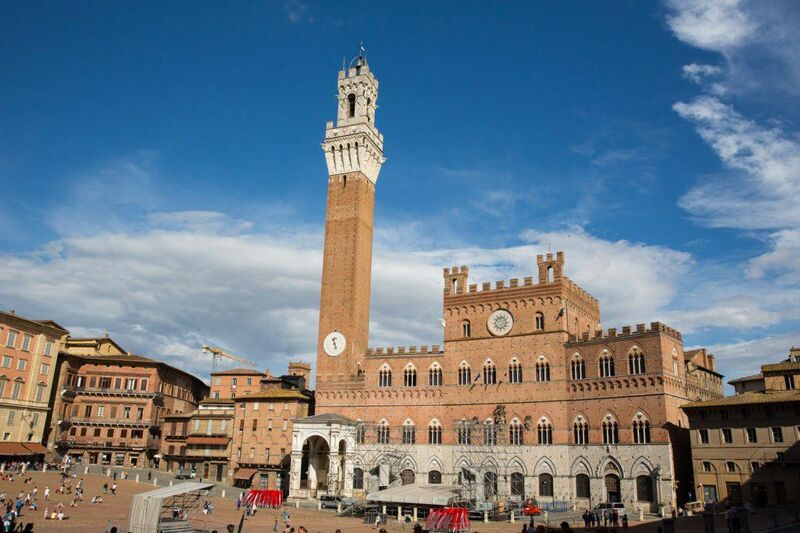 Several piazzas, or squares, make up this historic center. 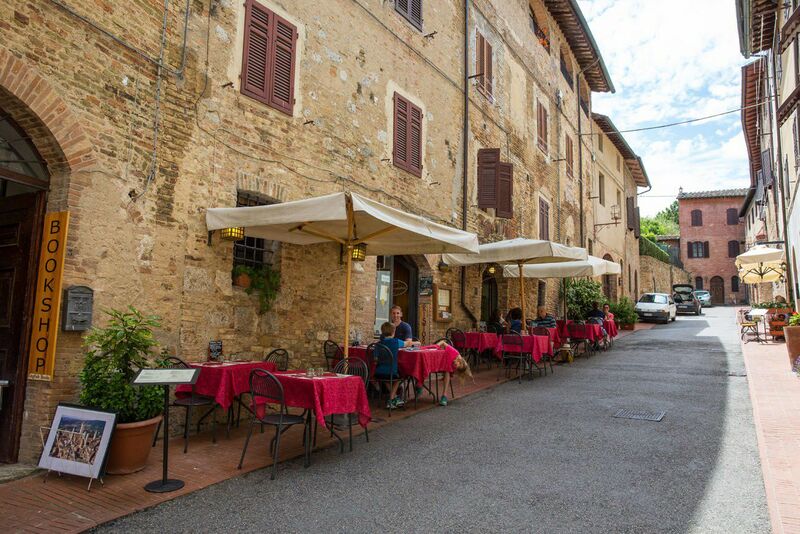 From here, you can visit the Duomo, a small museum called San Gimignano 1300, or find a cafe take in the scene. 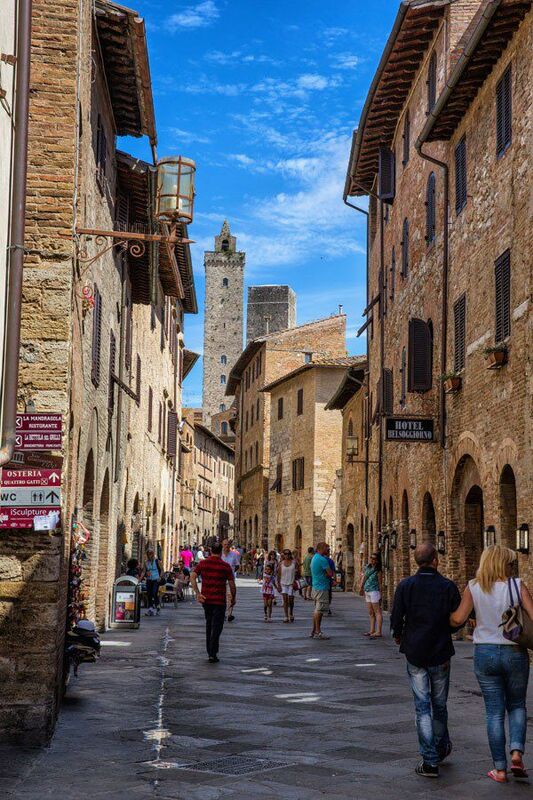 If you really want to see San Gimignano, don’t hesitate to explore the side streets. We wandered off the main tourist drag, for a little time away from the larger groups of visitors. 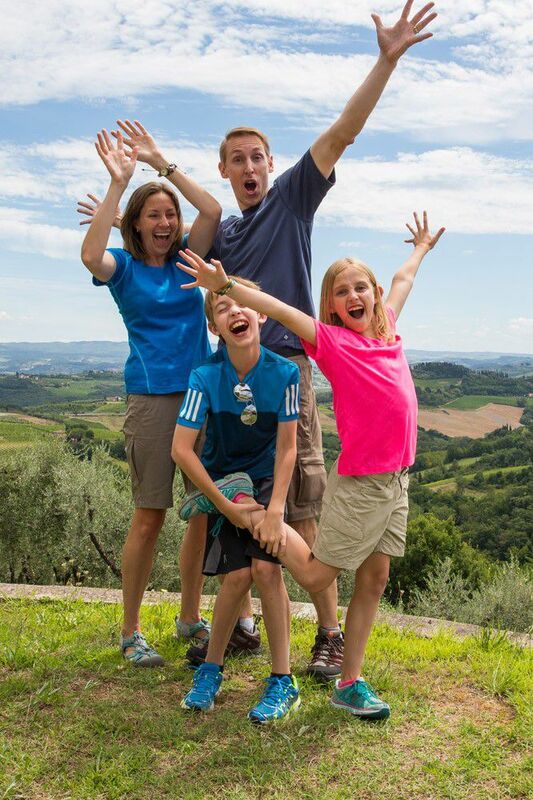 From here, we had a gorgeous view of Tuscany and we could take our goofy family photos that we love so much! 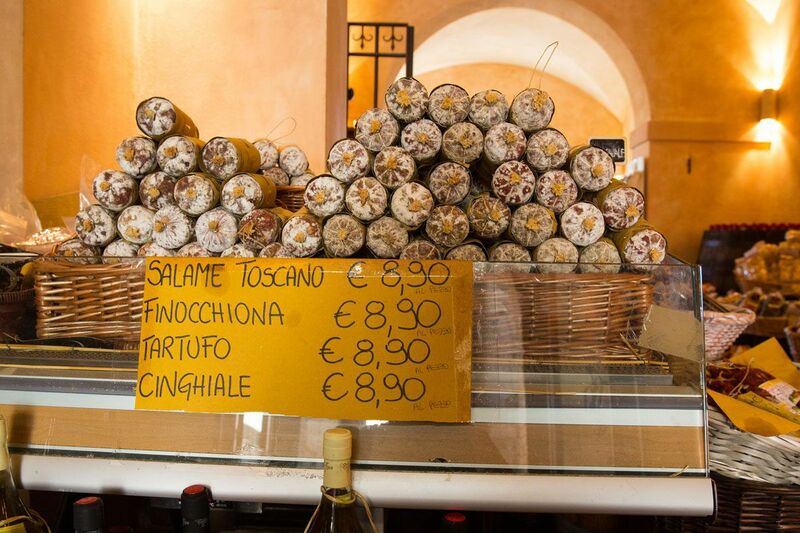 We wandered into the small shops, did a little shopping, and bought the best salami we have ever eaten. And finally, it was time for a late lunch. 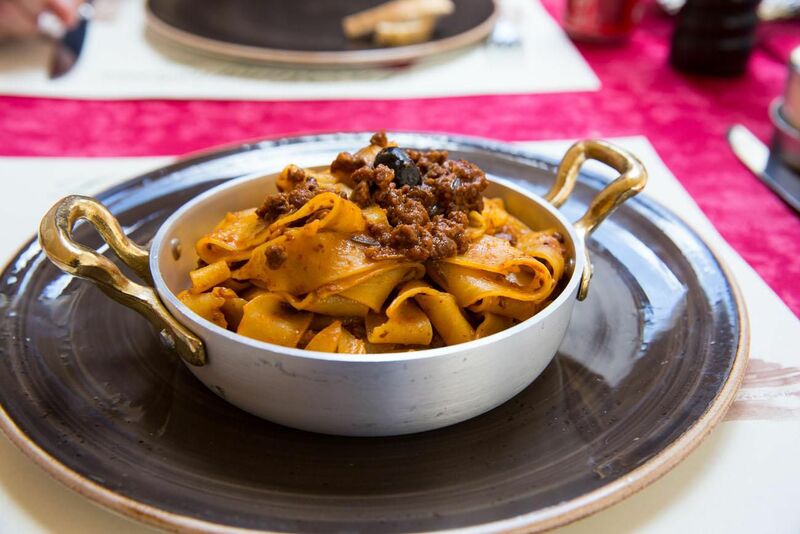 We ate at La Mangiatoia, a great restaurant that was featured in Bon Appetite Magazine. We had our best meal in Italy so far, eating chicken and mushrooms, spaghetti with meat sauce, and spaghetti with cinghiale meat sauce. So good!! 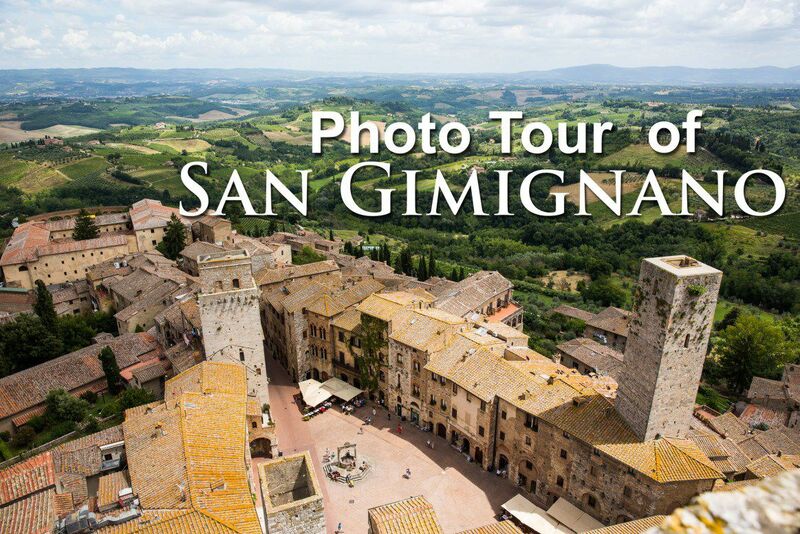 San Gimignano is a hill town that is easily connected by bus, although we did not have the best experience with the buses in Italy. 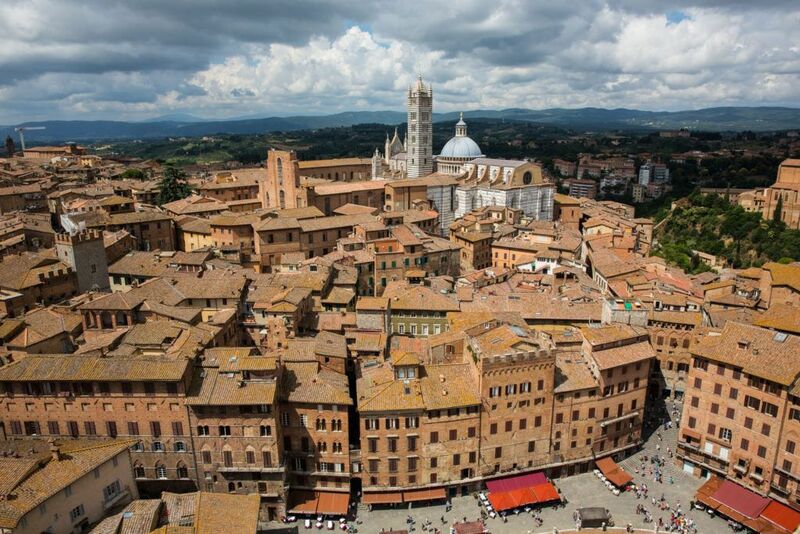 Our home base to explore Tuscany was Siena. 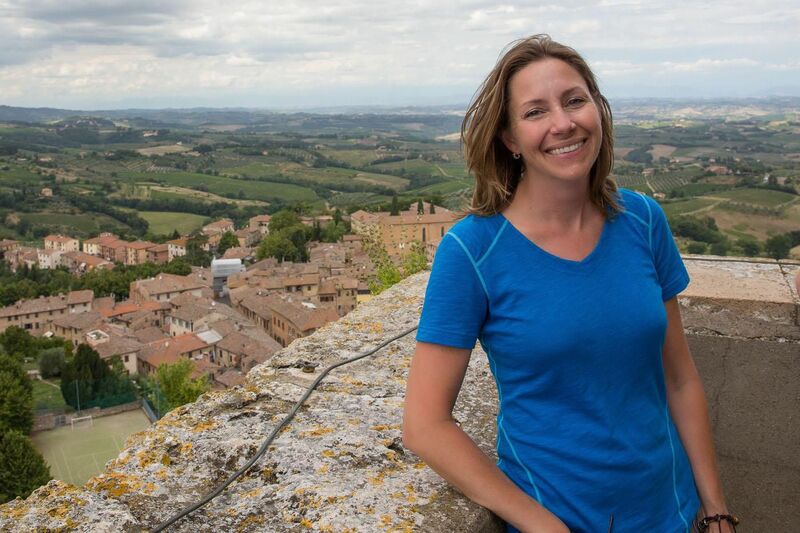 From Siena, we took the public bus to San Gimignano (about one hour). In the afternoon, to get back to Siena, the first bus did not arrive, which left us (and a growing crowd of people) waiting an extra 45 minutes for the second bus. On multiple occasions in Italy we were left waiting for buses that failed to show up. So yes, you can get here by bus, but be prepared to put yourself at the mercy of the Italian bus system. 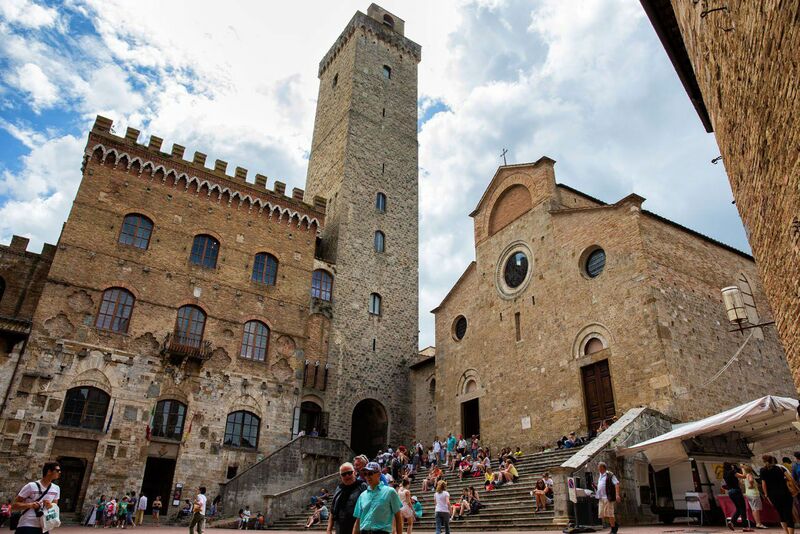 To learn more about getting to San Gimignano from Florence or Siena using public transportation, click here. If we did it again, we would either rent a car or hire a driver. 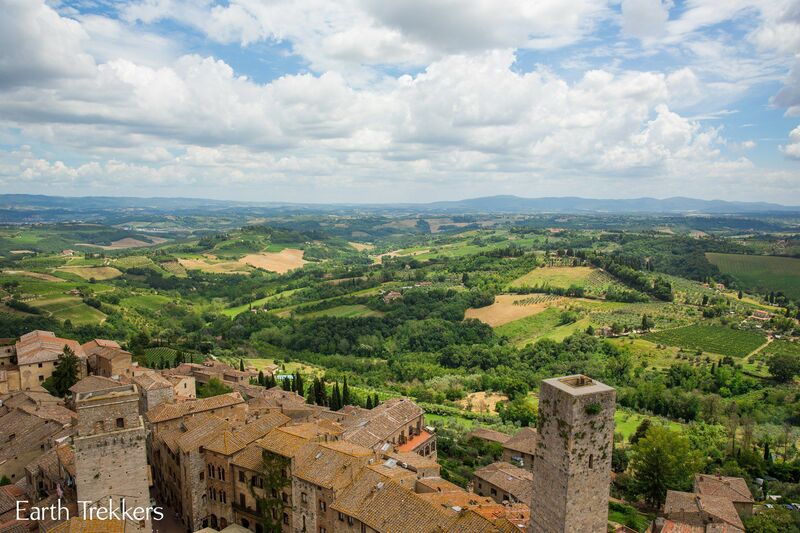 You can rent a car for the day from Florence or Siena. 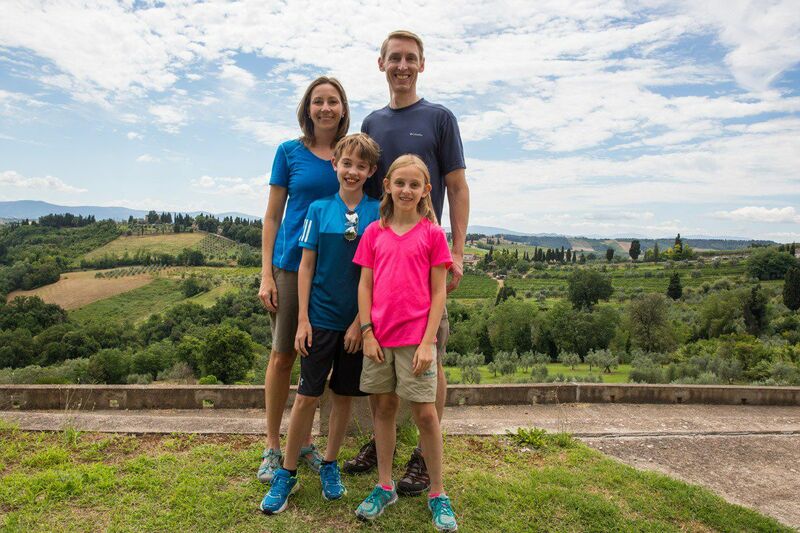 We rented a car for one day while in Siena to tour the Tuscan Hill towns. 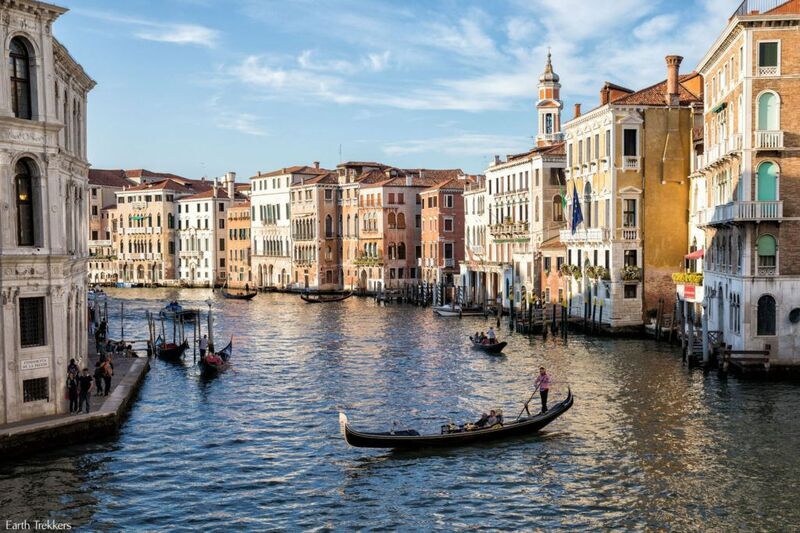 We used Hertz Noleggio Auto located near the train station and had a good experience. 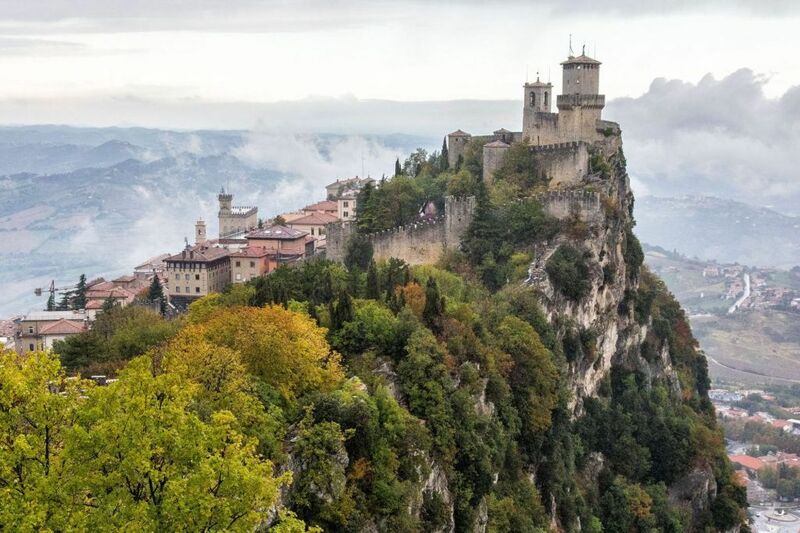 San Marino: Europe’s Most Underrated Destination? I am landing in airport of PISA on Thursday 11 April in the morning, and I would like to set an itinerary for my trip ending Sunday evening ( flying back on Monday early morning). I am thinking of hiring a car for the entire trip, would you recommand this? 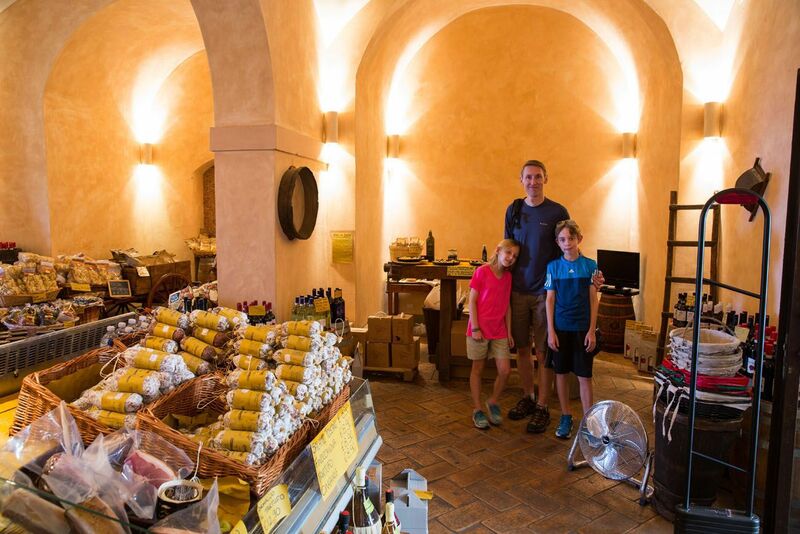 From going through your blog posts, I am think roughly of visiting PISA upon arrival, and then head to Florence then somewhere in tuscany/ san gimignano. As i like to combine city sightseeing and nature sightseeing ( hiking) I want to stay in two different places 2 nights each to allow for a balanced trip. what would you recommand, thank you for everything. Love the info you guys are providing and all the photos! I am planning to stay in Florence for 4 days. 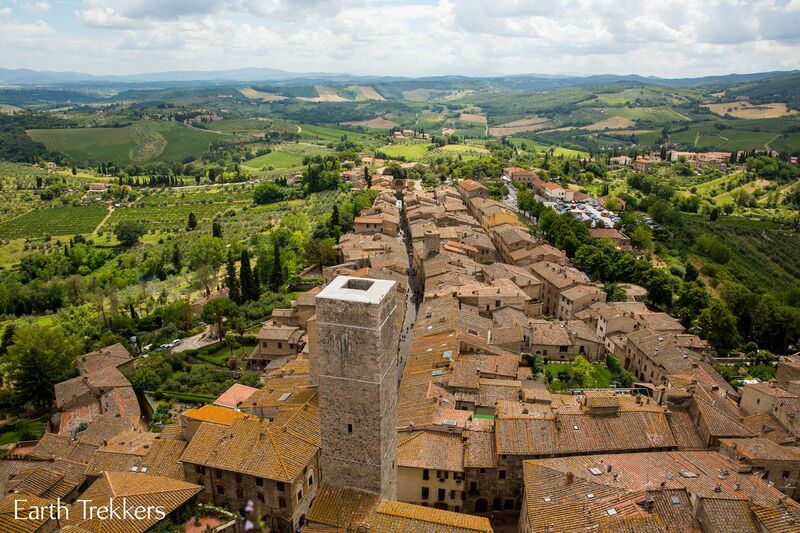 Would you say that 1 day trip to San Gimignano and 1 day trip to Sienna would be workable? I would have to bus it sadly….:(. 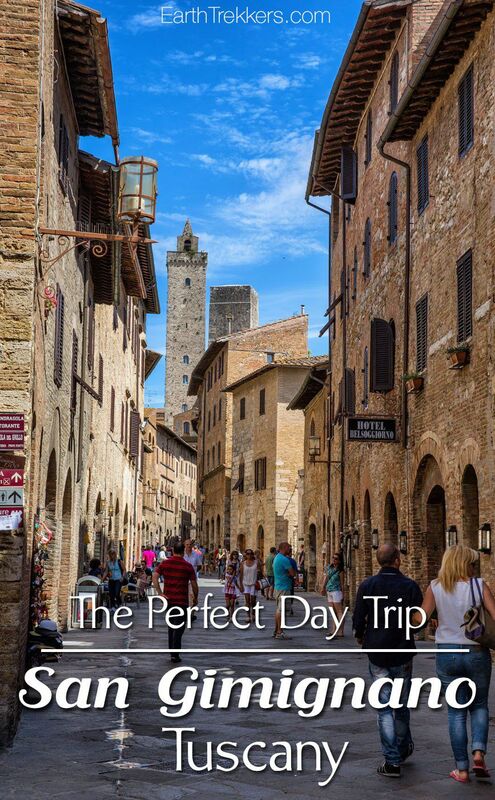 Is it feasible to do a day trip to Tuscany from Florence and see Siena and San Gimignano all in one day? Thanks Julie, you’re the best! I love your blog. I am enjoying the pictures and all the information. I wish my parents would have taken me on a trip like this. Thank you all for sharing your amazing adventure! I would never have been brave enough to take a year off and take the kids out of school, but all four of you will learn and remember so much from this trip, it is so worth it. 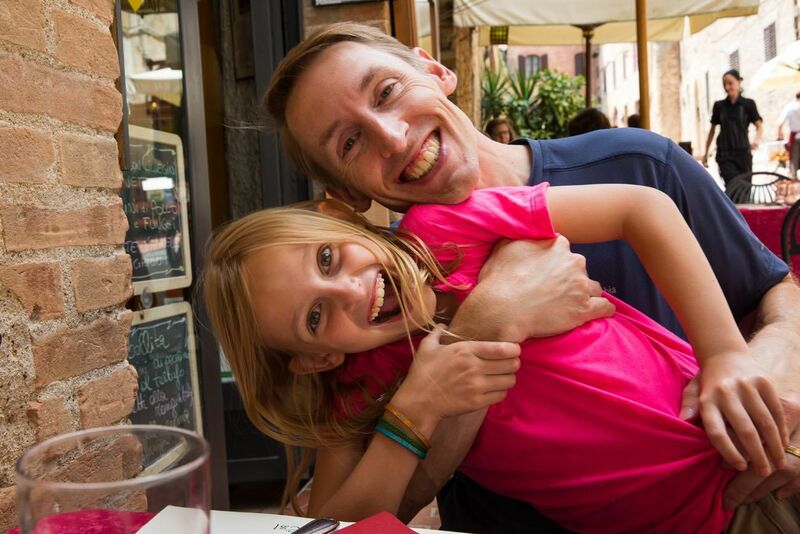 Your posts and photos — and Tyler’s videos (with some exciting help from Dad, especially on the Appian Way!) — are great. They give all your readers a fine flavor of each place. Thanks so much! Enjoy! Love watching this great journey. the pictures are incredible and I feel like I’m with you. It’s so exciting to see where you will be next. Just be safe and enjoy every minute with your kids !!! Thank you so much for sharing your journey. Blessings and safe travel to you.